HANDCRAFTED IN THE U.S.A. Piece by piece. NO lasers!!! New for 2019: Tennessee Wildlife Animal Puzzle. Pickens Puzzles has over 80 wooden jigsaw puzzles from animal puzzles, sea life puzzles to educational and other attractive jigsaw puzzles that appeal to all ages. Children & kids love them. And adults enjoy many of our wood puzzles for their creative art form and prominently display them in their home for all to admire. 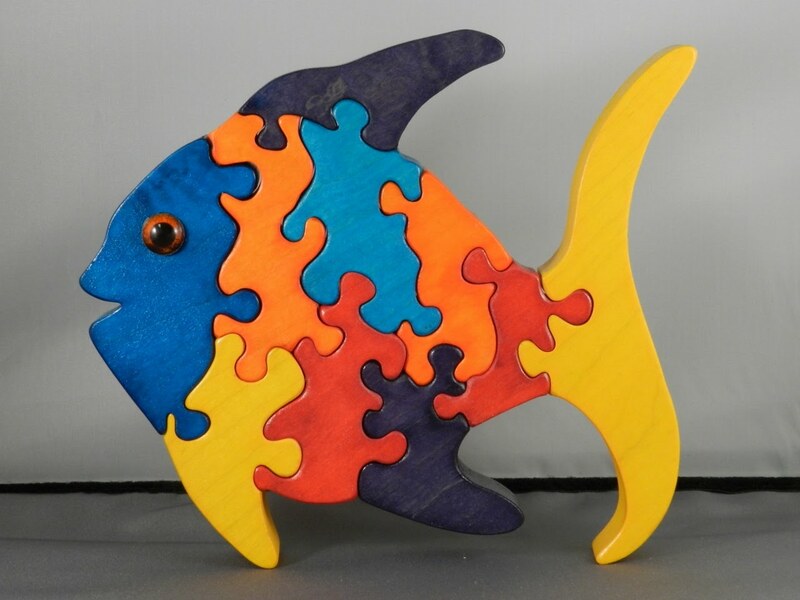 All of our wooden puzzles are skillfully handcrafted from the highest quality hardwoods. Our colored puzzles employ a proprietary process of applying safe food coloring and are then sealed with a nontoxic coating. The natural wood puzzles are coated with a safe tung oil finish and if desired can be re-coated just like furniture to restore the finish. Our puzzles will last a lifetime and will become treasured family keepsakes! The benefits of puzzles for kids and toddlers include eye-hand coordination, fine motor skills, spatial recognition, sequencing, and color recognition. Our most popular puzzles for children are the Snail puzzle and the Clock puzzle. The clock puzzle is used to teach kids how to tell time the old fashioned way! All Puzzles are Self-Standing for Impressive Display (except for tray style puzzles). Puzzles make great gifts for the holidays and special occasions. Give a gift of a puzzle and just watch the expression and reaction of the recipient! Browse through our website. And inquire via e-mail (brian@pickenspuzzles.com) if you have questions or don't see what you want. Many of our puzzles in the gallery were the result of requests by customers like you, and we welcome new ideas. Our State Wildlife Puzzles are very popular and make great gifts. We have designed eight of these animal puzzles; mostly in or near the states where we exhibit at craft shows. We will design and build a new state wildlife puzzle if we receive an order for 5 or more. Please inquire about the cost as some states are more intricate than others to create. All of our puzzles are guaranteed to work. If you are not satisfied with any puzzle, just return within seven days for a full refund. We Accept PayPal - YOU DO NOT HAVE TO HAVE AN ACCOUNT WITH PAYPAL TO USE YOUR CREDIT CARD with PayPal . Under Payment Method select PayPal. You will be directed to the PayPal site where you can use your credit card. We Ship via USPS Priority Mail and our shipping rates are reasonable - $7.50 for the first puzzle and $1.75 for each additional puzzle. Free shipping on orders over $99. ALL CREDIT CARD TRANSACTIONS ARE PROCESSED THROUGH PayPal. YOU DO NOT NEED AN ACCOUNT WITH PayPal to use your credit card.